When the Seattle Seahawks routed Denver a 43-8 in that Super Bowl game they also gave the Broncos a reflection of everything they were not and needed to become: young, fast and physical. Denver’s defence has since fully realized that vision, and cemented their status by swarming Pittsburgh quarterback Ben Roethlisberger and New England’s Tom Brady to set up a clash with the Carolina Panthers in the Feb. 7 NFL championship game. The Broncos organization embraced defence even before this season, starting two years ago when they signed defensive end DeMarcus Ware, added cornerback Aqib Talib, safety T.J. Ward and drafted cornerback Bradley Roby. The winds of change continued after Denver suffered a divisional playoff loss last season. They hired head coach Gary Kubiak, who promised the Broncos would get tougher and not simply rely on the arm of aging Peyton Manning, and brought aboard defensive coordinator Wade Phillips. The result has been devastating to opposing offences. The Broncos finished first in total defence, pass defence and sacks this season while carrying the team through all adversity. Manning had the most challenging year of his career, the running game faltered early and the receiving corps battled drops but none of it could halt Denver’s momentum. “Our defence is guiding us, let’s make that clear,” Manning said following the team’s AFC divisional win over the Steelers. And what a deep and dangerous defence it is. Nine-time Pro Bowl veteran Ware and linebacker Von Miller lead a fearsome pass rush while Pro Bowl cornerbacks Chris Harris Jr. and Talib, along with Roby, combine as some of the top pass defenders in the NFL. It is something Brady found out firsthand in this season’s AFC championship game, when the Broncos regularly punished him and picked off a two-point attempt that would have tied the game with 12 seconds left. Now the Broncos are set to face a weapon nobody has quite solved in Carolina’s Cam Newton, one of the top dual-threat quarterbacks of all-time and the quarterback of the NFL’s most potent offence. 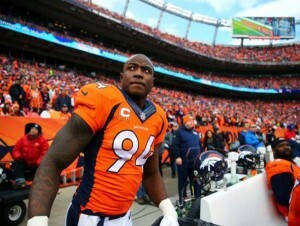 “He’s probably the most dangerous player in the NFL right now,” Talib conceded. But the Broncos defence is the most dangerous unit, and they are years in the making, constructed to make amends for Denver’s shortcomings of the past.